An inside look at the impressive lineup of new axes from Ernie Ball Music Man in 2019. Last month, music enthusiasts and guitar fans from around the world flocked to the Anaheim Convention Center for the 2019 NAMM Show, one of the biggest and most anticipated gear-related events of the year. 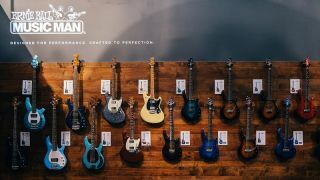 There were plenty of guitar manufacturers on hand, and among them the venerable Ernie Ball Music Man company, who introduced an impressive lineup of new axes for 2019. You can check out the latest below. John Petrucci's 2019 Majesty guitar in Tiger Eye finish features a three-piece Honduran mahogany neck with a center strip of highly figured maple, plus an alder body with carved maple top. A polyester gloss finish is applied to the complete instrument. Ernie Ball Music Man artist and infamous shredder, Jason Richardson, collaborated with the company's engineering team to create a Cutlass 7 model that is unique to his own preferences and style. The guitar features a figured roasted maple neck with ebony fingerboard, highlighted with 24 medium jumbo stainless steel frets, 15-inch radius and a slender neck carve for fast playability. Available worldwide in July, 2019. Ernie Ball Music Man welcomed Vulfpeck bassist Joe Dart to its signature artist series collection this year. Dart’s first signature bass was unveiled at NAMM followed up by a performance with his fellow Vulfpeck bandmate, Jack Stratton. The sleek new bass will be available in the coming months of 2019. Available worldwide in September, the 2019 Ernie Ball Music Man Short Scale StingRay Special is a passive bass, offering a big thumpy round sound in a convenient smaller package. With a body made from ash and a neck constructed from hard rock maple, this bass features a variety of reinvented and classic features, coming in two unique finishes. Thrice guitarist Dustin Kensrue's Artist Series StingRay features a lightweight African mahogany body with a satin vintage tobacco burst finish and a darkly tinted, satin maple neck. Among the many epic features is a unique control layout with a stacked tone and volume pot. The Hunter Hayes Artist Series Cutlass model is a very diverse instrument with wide-ranging sonic capabilities. Made from lightweight alder with a premium roasted figure maple neck, this Cutlass is made to Hunter’s exact specifications, with a brass saddle piezo bridge system, among many other distinct qualities. In addition to all these new guitar releases, Ernie Ball Music Man also took home the esteemed Best In Show – Best Electric Bass award for the StingRay Special. To close things out, here is Jared Dines demoing the Majesty along with fellow YouTuber, Ryan ‘Fluff’ Bruce.